Everyone wants use their SEO strategy to help them rank #1 for the top keywords. Lawyers want to rank #1 for attorney or lawyer. Real estate agents want to rank #1 for real estate. Shoe stores want to rank #1 for shoes, and so on. But what does being #1 achieve? You’re trying to get the right people to visit your website, not to get any particular position, right? Getting ranked in search engines is merely a way to generate that qualified traffic to your site. People often assume that to generate traffic, they have to get the #1 position for the top keywords. That’s not the case. You can generate plenty of traffic to your site without ever getting to #1 for the most popular phrases. And in many cases, the traffic arriving at your site will be better — the visitors will be more appropriate for your site. To draw the best types of visitors for your site, you have two things to understand: highly targeted keyword phrases and the search tail. Go local. One common strategy is, of course, to focus on local keywords. If you’re a real estate agent, don’t target real estate. Instead, target real estate in your area: Denver realtor, Chicago real estate, Dallas homes for sale, and so on. Focus on more specialized search terms. A realtor might target traffic on keywords related to commercial real estate or condos, for instance. Incorporate spelling mistakes. Some realtors target the very common misspelling realator, for instance. This technique isn’t as effective as it once was, because the search engines adjust for spelling mistakes, but it may still work to some degree. Specialized search terms are hidden away in the search tail. The search tail is an important concept to understand. Although the first few top keywords may get far more searches than any other search, when you look at the total number of searches, the top terms actually account for only a small percentage of the searches. Look below for search terms taken from Wordtracker, a great little tool that shows what search terms people are typing into search engines. When the term video games was searched for, Wordtracker returned 300 results containing that term. There isn’t room for 300, so check out the first few. Look at the Searches/Day column. It starts at 9,132 searches per day for video games, but immediately drops to 859 for music video games. By the time you get to the eighteenth search term, it’s down to just 101 searches a day. Position 300 gets only 7 searches a day. This fact leads people to focus on the top phrases, where, it appears, most of the searching is going on. However, look at the Cumulative Searches column. As you go down the list, you see the total of all searches from position one down to the current position. 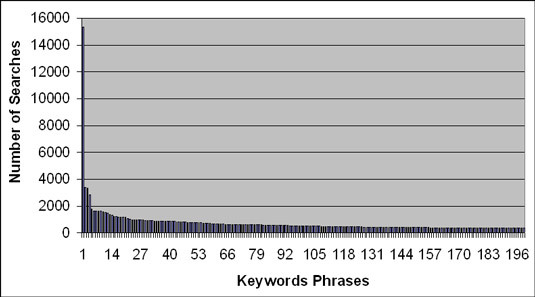 The first 18 keyword phrases account for 13,296 searches a day, of which 9,132 — 69 percent — are the top phrase video games. As you continue down, the cumulative number continues growing, of course. By the time you reach 300, the cumulative number has risen to 18,557, of which only 49 percent is the top phrase. As you can see from the numbers, there’s this long “tail”; the searches tail off. Wordtracker gave only the first 300 search phrases; certainly thousands more contain the phrase video games. For each phrase, Wordtracker gave an estimate of how often the phrase is searched upon every day. And even in these first 300 searches, most are not for the term video games but are for phrases containing the term video games. There’s more, of course. What if you look, for instance, for the term computer games? How about online games? How about searching for the term online video games? You get a completely different set of 300 keyword phrases from Wordtracker. Thus, if you get matched only with the exact phrase video games, you’re missing 49 percent of the first 300 phrases, many of which — perhaps most — would be useful to you. Add the thousands of other related phrases, and the primary term becomes less and less important. Even if you can’t rank well for a primary term, there’s still plenty of room to play. If you focus only on a primary term, you’re missing most of the action. However, consider for a moment local search results. Small businesses that need to be listed in the local results may still want to target the primary keywords, for two reasons. Because you’re up against a smaller number of competitors locally than you would be for a national search, with a little effort you can often rank well for the primary terms. Locally, there will be far fewer searches for a term than nationally, so you may need to target the primary terms to get a reasonable amount of traffic.